Recently I’ve changed my MacBook US keyboard to European one. Everything is fine with it except for the Tilda(~) key, which is located between Left Shift and Z keys on the EU keyboard, whereas usually it is located under Esc key on US and most PC keyboards. I do not know what was the purpose of this relocation or what historical background are behind it; I don’t care. What I care is that such location makes the use of Tilda key very annoying. And here is how I’ve solved it. Here are MacBook Air keyboards with US and RU (EU) layout, so as internal side of MacBook Air so called “top case” with keyboard attached. Recently I’ve flooded my MacBook Air 13″ mid-2011 with half a bottle of Coca-Cola 1L late-2011. Luckily, after immediate removal of the liquids, it was still working, more or less. Only “<” and “>” keys stopped working, keys’ lights persistently dimmed, and all the keys became sticky while typing. 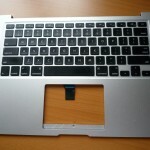 To repair MacBook Air Unibody after such a flooding, you cannot just replace a keyboard. You have to replace the whole top case, which includes keyboard and all the whole aluminum plate with palm rests; the top case does not include the touch pad (only a hole for it).